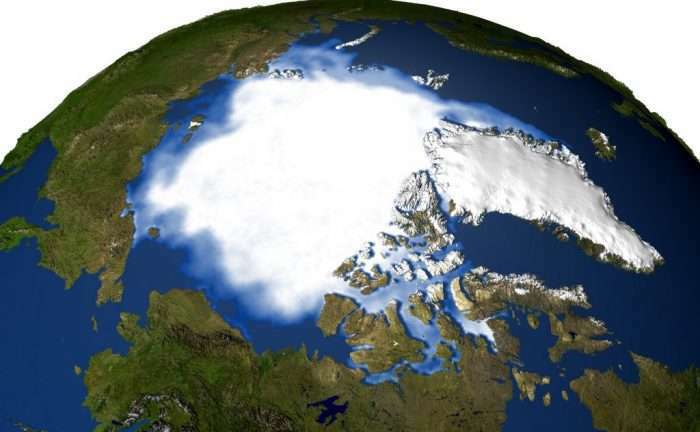 Their study, titled "Arctic Ice Management", appeared recently in Earth's Future, an online journal published by the American Geophysical Union. As they indicate, the current rate at which Arctic ice is disappearing it quite disconcerting. Moreover, humanity is not likely to be able to combat rising global temperatures in the coming decades without the presence of the polar ice cap. Of particular concern is the rate at which polar ice has been disappearing, which has been quite pronounced in recent decades. The rate of loss has been estimated at being between 3.5 percent and 4.1 percent per decade, with in an overall decrease of at least 15 percent since 1979 (when satellite measurements began). To make things worse, the rate at which ice is being lost is accelerating. "Global average temperatures have been observed to rise linearly with cumulative CO2 emissions and are predicted to continue to do so, resulting in temperature increases of perhaps 3°C or more by the end of the century. The Arctic region will continue to warm more rapidly than the global mean. Year-round reductions in Arctic sea ice are projected in virtually all scenarios, and a nearly ice-free (<106 km2 sea-ice extent for five consecutive years) Arctic Ocean is considered "likely" by 2050 in a business-as-usual scenario." One of the reasons the Arctic is warming faster than the rest of the planet has to do with strong ice-albedo feedback. Basically, fresh snow ice reflects up to 90 percent of sunlight while sea ice reflects sunlight with albedo up to 0.7, whereas open water (which has an albedo of close to 0.06) absorbs most sunlight. Ergo, as more ice melts, the more sunlight is absorbed, driving temperatures in the Arctic up further. To address this concern, the research team – led by Steven J. Desch, a professor from the School of Earth and Space Exploration – considered how the melting is connected to seasonal fluctuations. 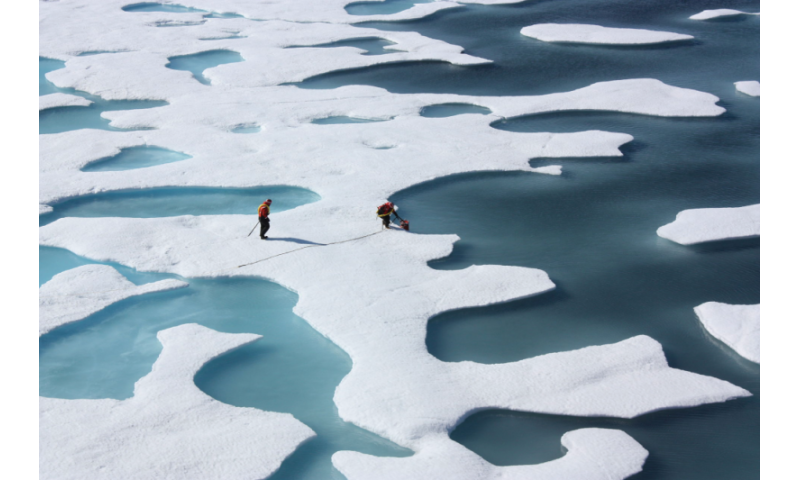 Essentially, the Arctic sea ice is getting thinner over time because new ice (aka. "first-year ice"), which is created with every passing winter, is typically just 1 meter (3.28 ft) thick. Ice that survives the summer in the Arctic is capable of growing and becoming "multiyear ice", with a typical thickness of 2 to 4 meters (6.56 to 13.12 ft). But thanks to the current trend, where summers are getting progressively warmer, "first-year ice" has been succumbing to summer melts and fracturing before it can grow. Whereas multiyear ice comprised 50 to 60 percent of all ice in the Arctic Ocean in the 1980s, by 2010, it made up just 15 percent. With this in mind, Desch and his colleagues considered a possible solution that would ensure that "first-year ice" would have a better chance of surviving the summer. By placing machines that would use wind power to generate pumps, they estimate that water could be brought to the surface over the course of an Arctic winter, when it would have the best chance of freezing. 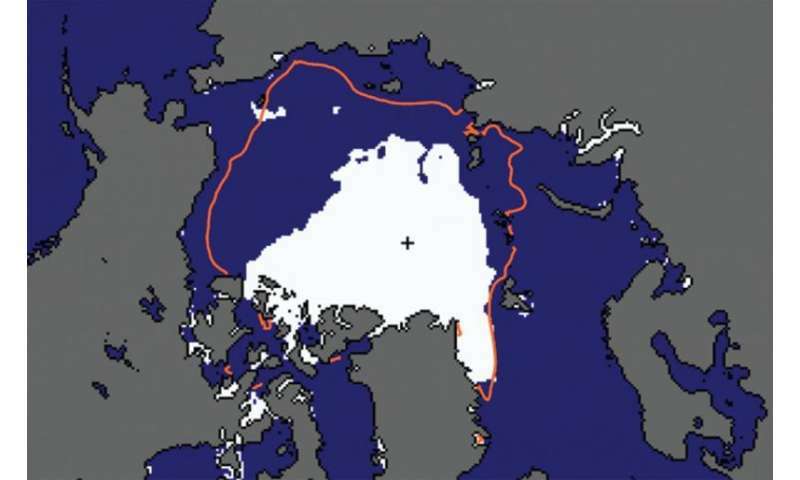 Over time, the negative feedback created by more ice would cause less sunlight to be absorbed by the Arctic ocean, thus leading to more cooling and more ice accumulation. This, they claim, could be done on a relatively modest budget of $500 billion per year for the entire Arctic, or $50 billion per year for 10 percent of the Arctic. While this may sounds like a huge figure, they are quick to point out that the cast covering the entire Arctic with ice-creating pumps – which could save trillions in GDP and countless lives- is equivalent to just 0.64 percent of current world gross domestic product (GDP) of $78 trillion. For a country like the United States, it represents just 13 percent of the current federal budget ($3.8 trillion). Presumably these wind generators and pumps would have to be ambulatory, moving and organizing themselves on the growing ice edges, advancing then retreating again as the seasons change. Might be quite a spectacle, the biannual transmigration of the windgenerating icemakers, a tourism rival to the wildebeest of the Masai Mara. Though it's hard to imagine how they would distribute their pumped water on to the ice without it freezing back into the pumping system. Wow only 50 years. Imagine how quickly an ice age could return. Wouldnt it be more efficient to use actual windmills that pumped mechanically? Good god, this giant AGW scam cannot end one moment too soon! And be aware, some of your student loan debt is paying these "Researchers" salaries. Well, at least the scheme is consistent with the science. It is chalk full of taxpayer money and built on total BS. Additional sunlight into additional ocean area will stimulate additional photosynthesis to remove additional CO2. Likely their model allows for that. Or there is another scenario, Additional sunlight stimulates additional photosynthesis creating an algae bloom which dies off and releases vast amounts of methane from the algae's rotting fonna, thus creating more greenhouse gasses for which to bake the planet with. And please denier goon squad, don't let it explode your heads. If we had sharks in the arctic then this proposal could jump them! Really, someone actually printed this paper? ?